When it comes to the more sophisticated end of the music spectrum, Vienna tends to be associated with older eras. It’s sort of inevitable when sons of the city include Mozart, Schubert, and Beethoven. But the Wien Modern festival belies that impression by showcasing the work of more contemporary composers. What’s Wien Modern all about? Put away the period costume and your plastic Mozart figurine. We’re talking more John Cage than Johann Strauss in a celebration of contemporary music that also draws in the visual arts. First established back in 1988 by Claudio Abbado, Wien Modern sits at the interface between tradition and innovation, the past and the future. At least that’s my impression. About a month’s worth of concerts and other events gently nudge aside the traditional music scene to give voice to more avant-garde approaches, fearlessly incorporating electronic music and the visual arts to pronounce classical music as an ongoing process. As well as featuring the work of some of the best contemporary composers the world has to offer, it also features some of the best performers, such as the Vienna Philharmonic Orchestra and the Vienna Symphony Orchestra. It’s still a little early for a programme, but the festival motto will be “Growth”. Soon as I get details, I’ll put them up. For now, all I know is that the RSO Vienna Radio Symphony Orchestra, conducted by Marin Alsop, will open the festival. 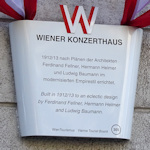 The Wien Modern programme ran under the motto “Sicherheit” (Security), with over 110 concerts, artistic performances, discussions, and more across 30 venues that explored and tested the edges of that concept: no risk, no fun. The Vienna Philharmonic Orchestra set the tone with the official opening concert featuring Cage and Schoenberg, plus the premiere of a work written for the orchestra by Johannes Maria Staud, and all without a conductor. The 2019 Wien Modern begins on October 31 and finishes on November 30. Some events will likely be free. Otherwise, individual tickets and festival passes will be available through the official website from around September 9th, where you’ll eventually also find a full schedule of events and locations.